Looking For A Guided Fishing Adventure in Natural North Florida? Visit Ross Hammock Ranch in Levy County! Call 352 447 0296 NOW for information or to book your hunting and fishing adventure of a lifetime! Many visitors to our Natural North Florida prefer professionally-guided adventures, especially saltwater fishing. That makes sense for many, as navigating our waters can be difficult, and there’s a decided advantage to fishing with a guide who fishes the area on a regular basis. And besides, many visitors don’t bring their own boats and tackle, making all-inclusive packages attractive. Ross Hammock Ranch is located in southern Levy County, near the beautiful Withlacoochee River and not far from Yankeetown and Inglis. They offer hunting and fishing (freshwater and saltwater) as well as lodging. It’s a complete experience for the discriminating outdoor enthusiast! Just to the west of Ross Hammock Ranch lies the rich sprawling salt water flats of the Gulf of Mexico. This provides year-round saltwater angling action. 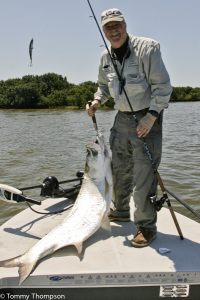 Depending on the season, our guests catch Tarpon (many over 100 pounds! ), Cobia, Redfish, Trout, Shark, Grouper, and other species. During season, scallop dive trips are also available for RHR guests. Anglers fishing from Ross Hammock Ranch in Levy County might catch a tarpon like this one!